Skybird HD has an Ingredients Analyser, which is used to identify which ingredients have matching effects, or multiple matching effects, so you can quickly identify which ingredients in your inventory can be combined. Never again will you have to waste ingredients in-game by trial-and-error tasting – the Skybird Ingredients analyser will correctly identify which ones will work. Simply select two ingredients you have in your inventory using the table (check marks appear next to selected ingredients – reselect again to remove) and, if they have matching effects, the analyser will tell you what potion(s) can be created as a result of mixing those ingredients. 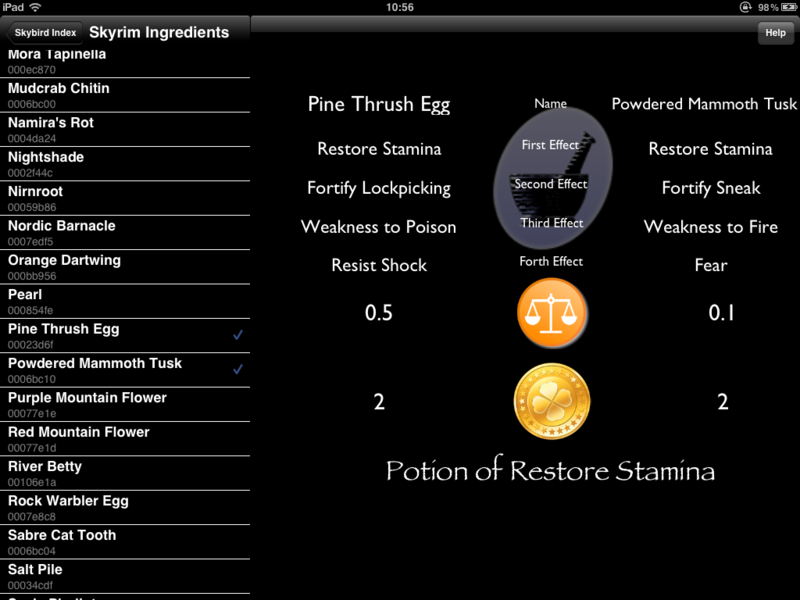 The detail pane also shows the Weight, Value and each of the four effects associated with each checked ingredient. 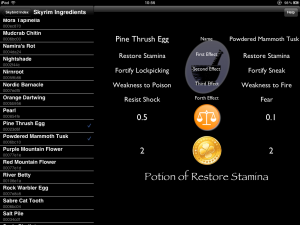 The table also includes the unique item codes for each ingredient, which will enable you to immediately create the ingredients at your location, using the in-game console. Full instructions are included with the app. Extremely easy to use, but very powerful. A clear advantage for budding alchemists.